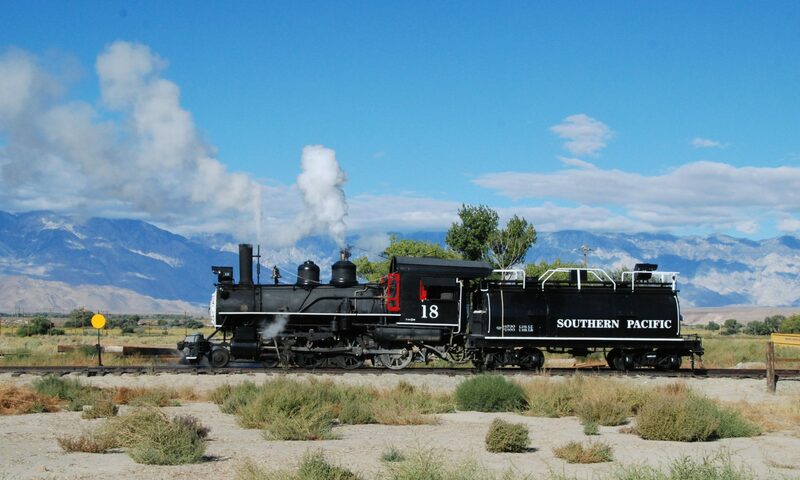 On the weekend of March 28-29 a good number of us gathered once again to tackle more work on the #18. On the list of jobs to do was to install the firebrick, finish fabricating and install the petticoat mounts, cut and install more boiler jacketing, finish plumbing and then mount the burner, and last but not least build some panel track so we can roll the #18 out of the tent far enough to set the sand dome atop the boiler. Marty helping Scott with trimming and installing the firebrick. Everything on that list was accomplished. 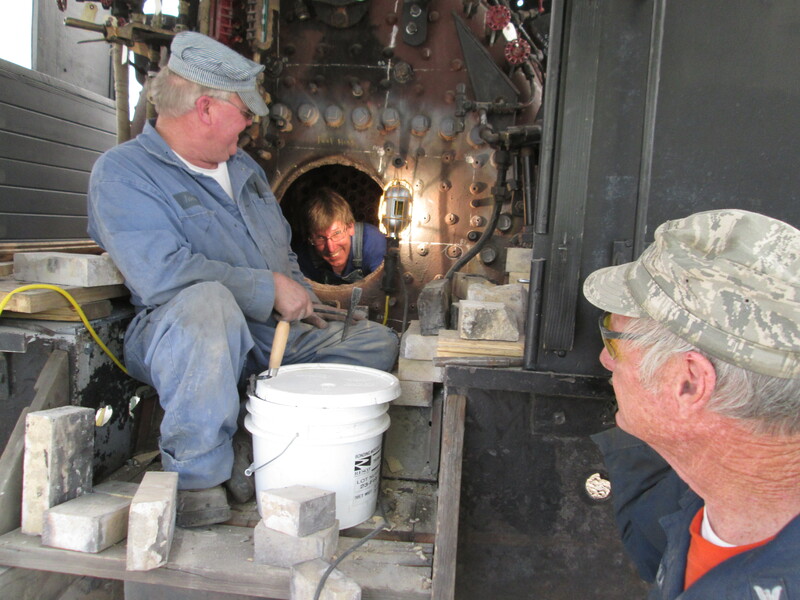 Scott and Marty spent the majority of both days laying out and installing the firebrick in the firebox. This required lots of fitting and chipping and refitting. The firebrick has several functions, it insulates the firebox sheets from the direct heat of the fire, stays hot (glowing red) after the fire is out which helps slowly cool the firebox, and if the fire accidently goes out the red hot brick will relight the fire. A special type of high heat mortar is used to hold the brick in place. 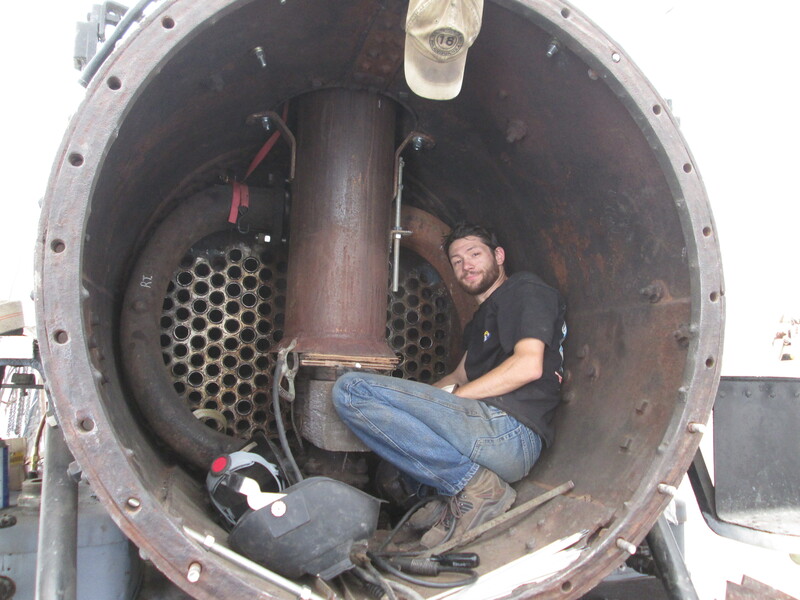 Working down under the locomotive, Mike and Ryan finished up the remaining plumbing for the burner. After some cleaning and wrapping the plumbing in insulation, it was all ready to go back on the engine along with the burner. Forest and Rick meanwhile worked on cutting and fitting the new boiler jacketing. This is a pretty straight forward process of tracing the old jacket sections and cutting the new ones. Simple but time consuming, and even after you copy the old jacket sheets they always seem to need more trimming. After the sheets were cut they were put in place and the brackets installed to clamp them in place. Up front in the smoke box I began assembling and welding the new petticoat pipe mounts. These are different from the originals in that they will be adjustable. Adjustment of the petty coat may come later after the engine has been steamed up and run. If the petticoat is not at the right height above the blast nozzle it can affect the draft in the boiler. On Sunday, Gary finished the assembly and welding of the mounts. 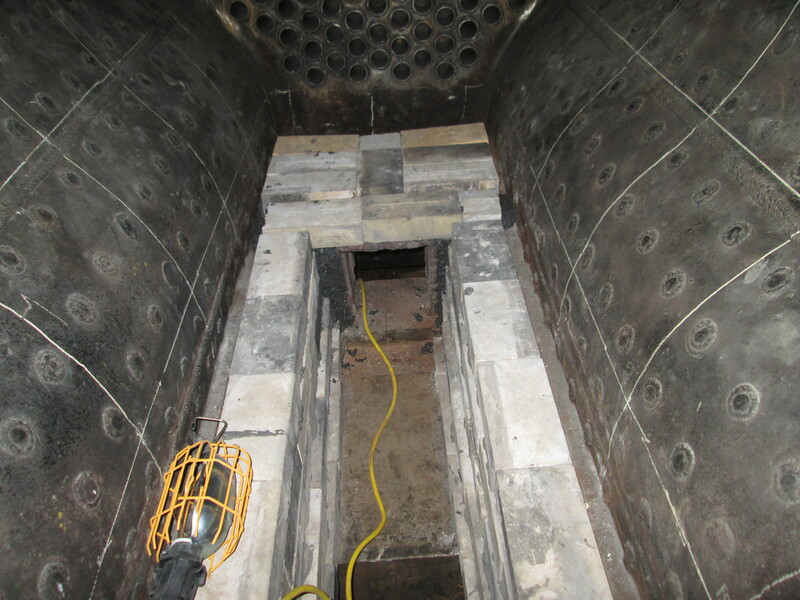 Next time we will work on the baffles and should also be able to reinstall the smokebox door. While all this was going on Dave was gathering rail to assemble the panel track. 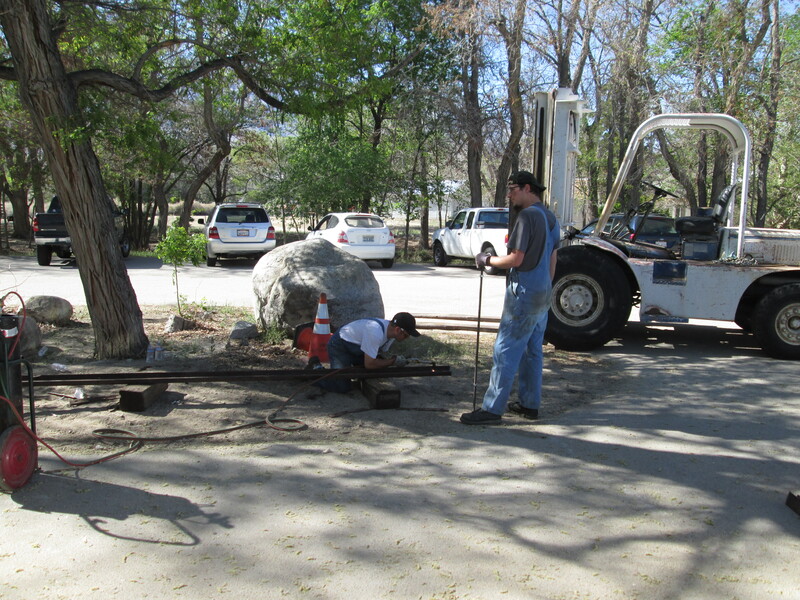 After finishing the burner, Mike and Ryan helped assemble the track. To accomplish this meant torching the rails to the same length and cutting holes in them for splice bars and all thread to hold the rails at the correct gauge. Beyond the weekends work, we also took delivery of the new rod brass billet. Modified-64 brass is the standard material to use with locomotive rod brasses and crown brasses. 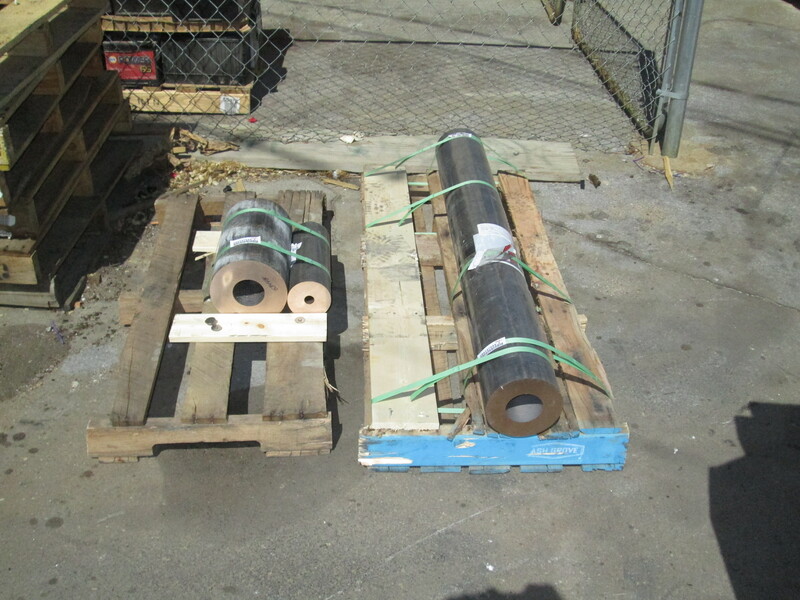 With the material on hand we are now headed towards getting the new brasses made and the rods installed. 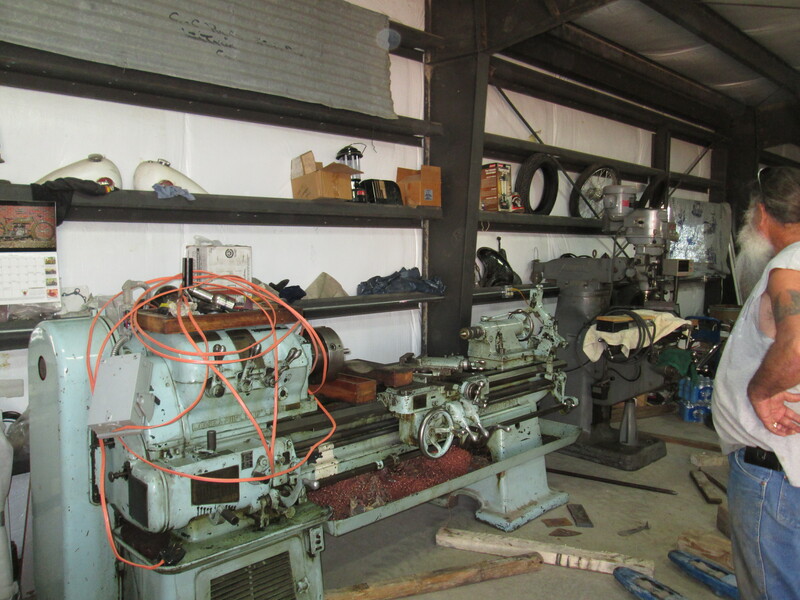 To help us facilitate final machining of the new bushings we now also have a new home for our lathe and mill. Joe Andrews our long time machinist and 50 year Independence resident is moving to Oregon and so we had to move our machine shop to a new location. We will miss Joe, but we have a great new building for the tools. Over at the museum, trackage and dirt work plans are being currently reviewed by the County public works department. Once stamped we can proceed with the dirt and track laying. We have also begun the process of getting building quotes and pricing. Things at the museum are moving forward, a little slowly perhaps, but forward none the less. And lastly, Ed Fleming our official videographer has put together a quick little piece on the bell installation from February. You can check it out here.